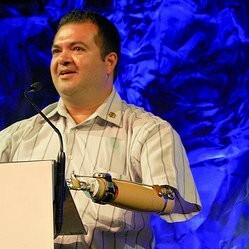 Alex Montoya is one of America’s most popular speakers. He is an award-winning motivational author, speaker, and writing coach. He has published five books, has carried the Olympic Torch, and spoken at places like Google, NASA, Wells Fargo, and Harvard University. His company, A-MOtivational Communications, produces inspirational books and talks, and specializes in writing and public speaking coaching. Alex holds degrees from the University of Notre Dame and the University of San Francisco. He travels the country speaking on overcoming disability and adversity, and living inspired. Find out more about Alex Montoya at http://www.alexmontoya.org.